During exercise your body's system for regulating temperature is kicked up into high gear. Heat production by the body can cause your internal temperature to rise up to as high as 104 degrees Fahrenheit, which can lead to potentially fatal complications. Fortunately, your body has internal processes that allow for control over this rise. However, you can take steps toward providing your body with the means to more efficiently cool yourself. When you exercise, the rate at which your body makes energy rapidly increases. This is also known as the metabolic rate. Heat is produced during metabolism, so an increase in metabolic rate also increases heat production. The action of large muscle groups contracting is mainly responsible for the change in body temperature during exercise. 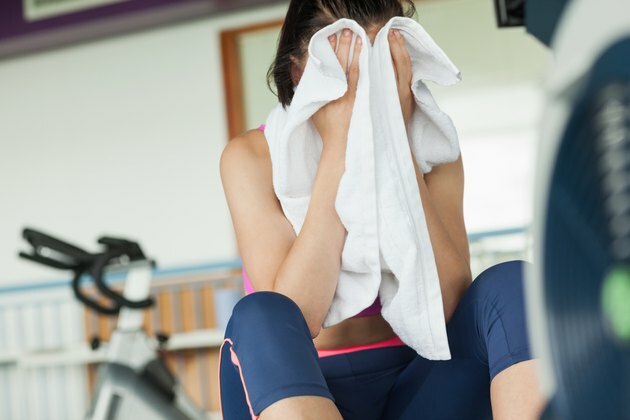 More heat production means a larger rise in body temperature during exercise. The hypothalamus of the brain works as the thermostat for temperature control inside the body. Throughout your body are temperature receptors that send feedback to the hypothalamus. If the hypothalamus receives indication that the body is either too hot or too cold, the brain will signal the body to react. For example, if you are outside on a hot day, temperature receptors on your skin will signal the heat to your hypothalamus which responds accordingly. The body regulates its temperature by means of convection, conduction and evaporation. Convection is the change in temperature due to the movement of air or water over the skin, for example, a breeze while you are running. Conduction transfers your body heat to another object. An example of this is swimming, the excess body heat you produce will transfer to the water. Evaporation is the release of heat through evaporating sweat which transfers water to a gas. You can be proactive at helping your body regulate its temperature. Do so by dressing appropriately for exercise, choose clothing that allows air to pass by the body assisting convection cooling. Staying hydrated also helps the body function during exercise, because so much water is lost from sweat, especially during exercise on a hot day. University of New Mexico: Thermoregulation; Chantal A. Vella, M.S and Len Kravitz, Ph.D.